Rachid Djebaili will always be a footnote in the history of Scottish football. He was one of many thousands of foreign-born players who came to Scotland in the aftermath of the Bosman-ruling and played for St Johnstone in 2001. His story is a fascinating one and says much about the subtle cultural threads that untangled so atrociously in Paris, leaving 129 people dead and many hundreds injured and traumatised. When Rachid scored for Saints – which admittedly was not often – he celebrated with fans by slapping his shaven head, as the fans chanted his name in faked Arabic accents ‘Oh Rachid Oh Rachid’. Who knows why it all started – Shia Muslim men slap their heads to express sorrow for the martyrdom of the Imam Hussein – but how this trans-migrated to Perth remains a mystery. Although his distinctive goal celebrations brought him cult status at St Johnstone it is Rachid’s debut for Algeria, which is etched in football history. In October 2001, the Algerian national team faced France in Paris. It was their first competitive game since the bloody colonial wars of independence and was ill-advisedly billed as ‘the peace game.’ The venue was the Stade de France, in St Denis, the stadium at the centre of last week’s atrocities. Algeria struggled against the cream of French football, including Zinedine Zidane, Marcel Desailly and Thierry Henry, and were already 4-1 down, when, in the 68th minute, Algeria’s all-time top goal scorer, Abdelhafid Tasfaout limped off. Rachid Djebaili had sat impatiently watching the game unfold and now his time had come. He was on the pitch for only nine minutes, and touched the ball three times, before rioting broke out in the stands and a pitch invasion led to the game being abandoned. Young Algerian fans fought with French riot police in and around the stadium, a few meters from where a suicide bomber ignited one of the Paris bombs, and few kilometres away from the dingy apartment in St Denis where French elite forces killed the Paris cell’s so-called ‘mastermind’, Abdelhamid Abaaoud. A burning resentment has swept through the deprived immigrant neighbourhoods of northern Paris for decades now taking football by the throat and a generation of young Algerians, many of them born and raised in France, have yet to concede that the colonial wars are over. A burning discontent lurks in les banlieues the brutal sink-estates that rim round Paris and that discontent has curdled into football violence, street crime and terrorism. Rachid Djebaili was not only making his international debut, he was playing for a nation whose football traditions are now a byword for national self-determination. 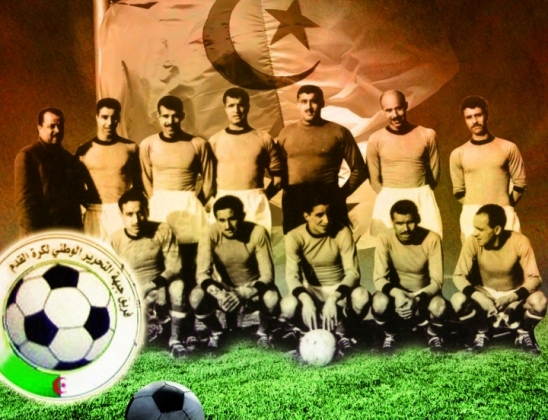 For the first two decades of their football existence, Algeria played under the flag of independence and were known as Equipe FLN, the sporting wing of Front de Liberation Nationale (FLN) the Algerian resistance movement. Equipe FLN was the brainchild of Mohammed Boumezrag, a keen footballer who thought up the idea of a resistance team at a seminar at the World Festival of Youth in Moscow in 1957. For the next five years Equipe FLN played over 50 invitation-games against friendly nations many in Eastern Europe and in Asia including matches against Hungary and Yugoslavia, and a free-scoring tour of Vietnam where they bagged 27 goals in four games. FLN Equipe were seen by the French as a rogue team, never recognised by FIFA and hated by football officials who tried to hound them out of existence. But before every game, they hoisted the flag of the Algerian Revolution, stood beneath the red star and crescent and sang an anti-colonial anthem, which had been written by a jailed activist. The events of April 1958 transformed Algerian football and brought their independence movement into a new romantic light. It is the stuff of feature films and deserves to be told more widely. Rachid Mekhloufi stood on the brink on fame. He had scored 25 goal for St Etienne and had won five international caps when he was drafted into the French World Cup squad to play in Sweden in the summer of 1958. His striking partnership with the Moroccan- born forward Just Fontain was predicted to dominate the tournament. But suddenly and dramatically Rachid Mekhloufi went missing. He was not alone, another French internationalist Monaco’s Mekhloufi Zitouni, who was about to sign for Real Madrid, had also disappeared, quickly they were followed by seven other Algerian-born footballers. Among their number was Mohamed Maouche a striker with Stade De Reims who played in front of 45,000 spectators at Easter Road when Hibernian became the first British team to play in the European Cup. The 1958 World Cup subsequently launched the career of the teenage Brazilian sensation Pele and the story of the Algerian resisters has been air-brushed from official history. The flight of the Algerian players was a covert and well-planned operation – a great escape – meticulously co-ordinated to fool and embarrass the French authorities and promote FLN resistance. Seven left France over the Swiss border, some on fake passports and flew to Tunis, others travelled via Nice and Italy. Two were arrested as they tried to leave France and jailed for a year. Mekloufi, who had moved to France of a military visa, was sentenced in absentia to ten years imprisonment for desertion and instead of starring at the World Cup travelled with Equipe FLN to invitation matches around the world. The French press dismissed them as ‘The Desert Rats’ but for Algerian fans they will always be known as Le onze de l’indépendence (The Independence Eleven). The escapees are now part of the folklore of Algerian football. Their self-sacrifice, leaving careers, salaries and stardom behind, has become the benchmark by which all others are measured. Last year, the Algerian international team donated $9m to the people of Gaza and acknowledge the story of their forefathers in the gift. The story of Equipe FLN is so rich in myth that few now wish to challenge its aura. The writer Albert Camus, who purportedly played as a goalkeeper for Algeria and coined the famous phrase – “All that I know most surely about morality and obligations I owe to football,” drank out on the myth. After playing for his school team in Algiers, Camus graduated to a Junior club Racing Universitaire Algerios (RUA) but was never good enough to play for Equipe FLN nor displace their veteran keeper, Abderrahman Ibrir of Olympique de Marseilles. The story is faithfully recounted wherever Algerians congregate. St Johnstone’s Rachid Djebaili learnt of Equipe FLN’s exploits from his grandfather and again from his father. Although he had been born in Bescancon in the East of France, he qualified to play for Algeria through dual-citizenship, and always felt that was where he was from. On the night he phoned home from Perth, to tell his parents he had been chosen to play for Algeria, his father burst into tears and was “speechless with pride”. Paradoxically, when Rachid waited for his chance on to the pitch in St Denis he spent a dreamy first half watching the most famous Algerian footballer of all time, the peerless Zinedine Zidane, who was also born in France after his family fled Algeria, on the eve of the Independence Wars. Zidane had been capped by France as sixteen year old and as he escalated through the age groups played in an era when he could not have jumped ship to Algeria even if he had chosen to. Zidane’s World Cup winning team of 1998 were supposed to be the French team that united the country’s troubled immigrant communities but that was a dream that barely lasted a brilliant summer, and for many Algerians it was never likely to dim the legend of Equipe FLN. Football has become the place where Algeria’s legacy has been played out. The Mayor of Nice tried to ban the “ostentatious use” of Algerian flags in the centre of Nice in the run up to Algeria’s game against Germany in last 16 of World Cup, when France were also due to play Nigeria. After rioting in the wake of Algeria’s matches, the right-wing politician Marine Le Pen demanded that dual-citizenship should be abolished. “What is clear is there is a not an insignificant number of people that are choosing Algeria over France,” Le Pen said. “You should pick: are you Algerian or French, Moroccan or French, but you cannot be both.” That was a view disputed by many young people. “We know what we are not: French,” Karim Beghache, a 22-year-old Algerian hip-hop fan, who lives in St Denis told a New York Times journalist. “But we do not know what we are.” “Here in France,” he added, “anti-Algerian racism is everywhere. Because of a group of feeble-minded extremists, we have all been stigmatized.” Beghache was specifically talking about brothers, Saïd and Chérif Kouachi, who infamously forced their way into the offices of the satirical magazine Charlie Hebdo killing 11 people, and claimed to be fighting on behalf of radical Islam, for the Yemeni branch of Al Qaueda. But both were from an Algerian family with a troubled economic and psychological background, and had grown up in a depressing housing project in Genneviliers in north-west Paris. In a story ripe with coincidence Cherif was a successful striker for the French amateur football club AS Chambertoise and briefly flirted with a professional career. The brothers were keen followers of the Algerian national team and then in their late teens had been in the Stade De France on the riotous day that St Johnstone’s Rachid Djebaili made his international debut. Great stuff, Stuart. For those of us of a certain age the Algerian struggle was a great inspiration in the cause of national liberation, not just in deeds but on the cultural front. This reminder of the sports front is very apt. Made me think, in stark contrast, of the shameful episode of the SFA and the Scotland team in Chile after the Pinochet coup in a stadium synonymous with bloody repression. I remember seeing a documentary not so long ago on this extraordinary Algerian FLN team. Was it on All Jazeera or could it have been C4? Fine piece of writing Stuart, how about publishing this sort of thing on the BBC website? BC > BBC. No need. I did not realise Hibs were a british football club, I”d always thought o them as a Scottish football club? Runs counter to what you are trying to explain! Similarly, Celtic in 1967 were the first Scottish team to win the European Cup, Andy Murray is Scottish and Ben Nevis is Sotland’s highest mountain! Why share things with another country whose leaders have utter contempt for your country, culture and political beliefs? Fascinating story Stuart, particularly the importance of setting nationhood above personal reward and career. Algeria evidently has fewer ‘rogues’ than Scotland. “Last year, the Algerian international team donated $9m to the people of Gaza.” Oh yeah? This was a claim made by some random guy on Twitter and then enthusiastically picked by the mainstream press. There’s absolutely no first hand evidence that this was ever intended, let alone that it happened. I guess we’d know if it had. Come on, Mr Cosgrove. You’re supposed to be a journalist – rule number one, check your facts with an independent source. Oh, and for your future reference, you may like to note that posts on Twitter aren’t always reliable.